The massive marketing and advertising efforts made by the Indian ecommerce firms may finally be paying off, at least in terms of catching the attention of potential buyers. According to Google Trends, the search for 'online shopping' has increased in regions such as Tripura, Sikkim, Mizoram, Meghalaya, Andaman and Nicobar Islands in the last seven days, registering a fillip of a whopping 250%. This clearly is good news for large ecommerce players such as Amazon, Flipkart, Snapdeal and ShopClues. These companies announced their festive sales starting from October 1. "Online retailers are focusing on reaching out to small towns by improving their supply chain capabilities, broadcasting television commercials, providing easy payment options such as COD (cash on delivery), and by offering coupons and discounts," said Poonam Saini, a lead analyst at Technavio, in the online fashion retail market report launched in June. The festive season is likely to register record-breaking sales, revenues, and highest ever purchase rate per minute for e-commerce giants, according to a survey and analysis released on 30 September by industry lobby group The Associated Chambers of Commerce and Industry of India (ASSOCHAM). 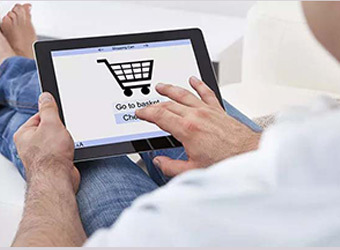 "This is expected to be the busiest festive season for e-commerce companies as Indian consumers are likely to spend up to Rs 25,000 crore and more as against over Rs 20,000 crore spent in festive season last year thereby registering about 25 per cent growth," said D.S. Rawat, secretary general of ASSOCHAM, while releasing the findings. With the increase in better infrastructure in terms of logistics, broadband and Internet-ready devices the sales will go up not only in metros but in tier two and three cities as well. The major chunk will come from these cities where internet penetration has increased in the recent past. Technavio's market research study also identified increased participation from Tier 2 and Tier 3 cities amongst the three emerging trends that are expected to propel the online fashion retail market in India. The other two include demand for private label brands and distribution of consumers between mobile application and websites. "Apps are a faster alternative to mobile web browsing that allow consumers to shop on the go," the report said. Meanwhile, ecommerce firms are doing their best to woo customers. Besides discounts, a few ecommerce players are even providing interest-free zero-cost EMIs, in select cities, across all of its product offerings. But it's all for a bigger reason. This festival season is extremely important for the Indian e-commerce firms, which are not only trying to outdo each other in what is a stiff battle for supremacy, but are also struggling with high cash burn, losses and funding crunch.